StrangeGlove turned towards the console to forwardise Doomsday but he felt someone staring at him. 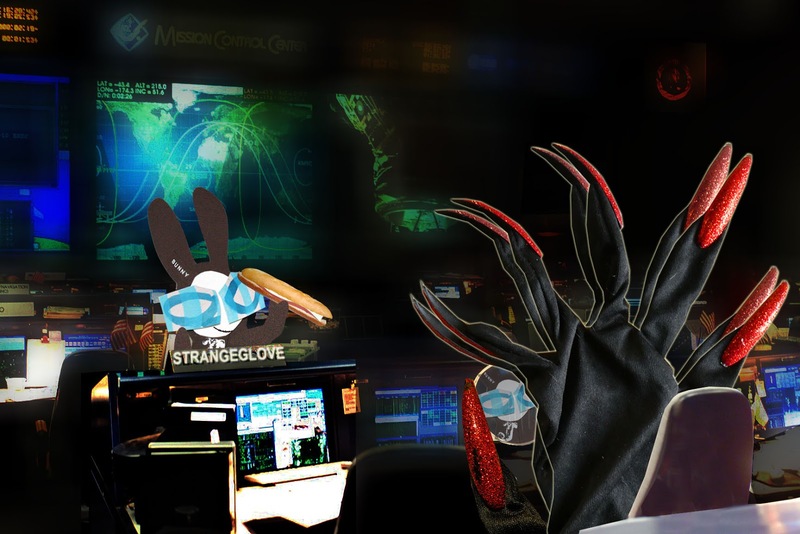 "Doomsday deserves a snack," said the Wabbit. He waved a large sandwich. Doctor StrangeGlove stiffened. "Who are you? Who sent you? The subversives?" The Wabbit merely giggled. "The kitchen staff thought you might feel peckish. They sent a sandwich." StrangeGlove felt suddenly hungry. "What kind of sandwich?" "An eating one of course," shrugged the Wabbit. StrangeGlove was furious and all his fingers waved. "This bunker room is sealed tight!" "Nothing's completely tight," said the Wabbit. "It's tight if I say it's tight," screamed StrangeGlove. The Wabbit took a bite from the sandwich and chewed for a while. His eyes lit up and he winked. "So tight it squeaks." He waved the sandwich. "Go on, go on!" "My enemies are smart," said StrangeGlove, "It might be a bomb." The Wabbit broke the sandwich in two, ate half of it and laughed. "Well the bomb must be in your bit." StrangeGlove grabbed the remains of the sandwich and guzzled it down. The Wabbit grinned and waited. "Got another one?" asked StrangeGlove. The Wabbit sighed. "Yes, but I'm not sure I can get it to you by Doomsday." StrangeGlove smacked his lips. "I'm putting Doomsday on ice."